Electronic-speckle-pattern-interferometry (ESPI) determines the difference between two small deformation states of the same inspected object. This is achieved by taking pictures before and after excitation of the object and superimposing them. The resulting speckle-pattern-interferometry then shows a fringe pattern, which can be interpreted as contour lines of the same state of deformation. The distance between two fringes corresponds to half the laser wavelength which is 400nm. Therefore ESPI allows for sensitive and non- contact detection of defects. In order to generate the two different deformation states it is necessary to excite the inspected object. This can be done by thermal and mechanical methods like local under- and overpressure or heating up the whole object. 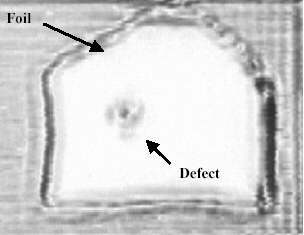 The appearance of defects, which can be detected by ESPI, depends strongly on the method of excitation, e.g. delaminations or cavities detectable with mechanical excitation, cracks with thermal excitation. 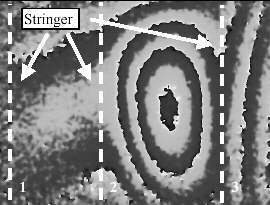 The drawback of all of these techniques is that the complete object is deformed which results in a high order of fringes and consequently to a deterioration of fringe resolution so that small defects are harder to detect. Another recently developed way of excitation is with an ultrasound transducer connected to the inspected object. Injection of ultrasound into the component results in mechanical power dissipation in defect areas which is transformed into heat by hysteresis (1). The advantage of this method is its defect selective sensitivity as not the entire object is deformed like in the classical methods, but only areas with thermally active defects are generating heat and cause deformations on top of the defect at the surface of the object. The resolution of the ESPI with this kind of excitation is higher than with conventional methods, the higher resolution also improves the sensitivity for detection of smaller defects. This is shown in the measurements of a stringer delamination of a flap. Also impacts in CFRP-plates and delaminations of wood (with veneer or polymer coating) can be detected by the method. To verify the results of the new ESPI method, they were correlated to results of other non- destructive testing methods like ultrasound lockin thermography and non linear vibrometry. Quality control requires the detection of defects that are caused by the production process or later by deterioration. If such defects are detected early enough the production process can be improved or unsafe components can be exchanged early enough to avoid failure. It is often necessary to detect the defects in a remote and fast way. Therefore it is important to measure large areas in a short time with a high resolution. Deformation measuring gives information whether the surface of materials and structures is intact or not. Electronic- speckle-pattern-interferometry (ESPI) is an established optical method which displays the difference between surface deformations as a fringe pattern (i.e. lines of equal deformation). Conventionally external generation (thermal, over -and underpressure) is used for the excitation of the measured object. 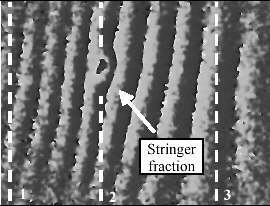 Defects in materials produce discontinuous fringes and enhance the order of fringes. The disadvantage of these techniques is that the complete object is deformed. Small defects cannot be detected because the order of fringes is too high. When the object is exposed to ultrasound only the defects are heated. 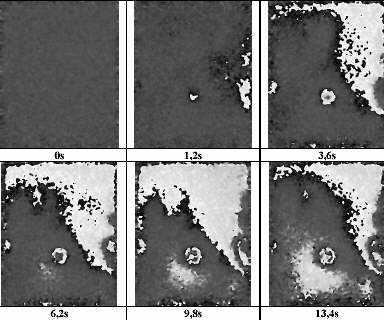 Therefore this effect is suited for selective imaging of defects. A mechanical defect is generally characterized by local stress concentration and/or an enhanced mechanical loss angle ("hysteresis). In addition non-Hookes behaviour is found by excitation of the sample by ultrasound. Internal friction in cracks converts acoustic wave energy into heat. The area in the hysteresis curve is the energy density generated by one loading cycle of a component (figure 1). The hysteresis effect results in acoustic wave attenuation, which is higher in polymers than in metals because of their structure (molecular chains slide against each another) (2). The local thermal expansion in the defect area causes bumps on the surface of the object, which can be detected by ESPI..
Ultrasound excitation is already successfully used by other non-destructive inspection methods. The clapping of internal surfaces against one another can be detected by non linear vibrometry. For that purpose, the sample is sinusoidally excited. In the clapping region the signal is mechanically rectified, as there is no transmission of tensile stress. This results in higher harmonics in the reflected signal (whole-numbered multiples of the excitation frequency). These can be calculated by Fourier transformation of the local surface amplitude, which is remotely monitored using a laser scanning vibrometer (3). With lockin- or burst-phase-thermography using excitation by elastic waves the resulting temperature field is monitored (4). Ultrasound-ESPI has the advantages that it can measure defect-vibrations like vibrometry and it can also monitor the effect of local heating (detection by thermography). In an ESPI-measurement a diffuse reflecting sample is exposed to a laser beam (figure 2). The beam reflected by the object and a reference beam are superposed, thereby causing an interference pattern. The resulting image of the object has a grainy structure (speckle- pattern). This image is recorded by a CCD-camera. The speckle pattern moves when wavelength-sized deformations of the object occur. The analysis of the speckle motion or of speckle displacement between two deformation states of the inspected object results in a fringe pattern that displays lines of equal deformation of the surface (instead of the equal- height-lines on a map). The components of the object deformations, perpendicular (out of plane) or tangential (in-plane) to the object surface can be imaged this way (5). Therefore a complete 3D-description of the deformation field is possible. For our experiments we used the out of plane component of a 3D real-time ESPI and a 1D miniature ESPI (6). The height difference is the distance between two fringes which is equivalent to half the laser wavelength (l/2=400nm). The ultrasound transducer generates a frequency of about 20 kHz. The nominal power varied between 200 and 2000 Watt over a time period between 100ms and 5000ms. However, the power really injected into the sample was only 10-20% of the nominal power (1). For reducing vibrations the reference image must be taken within 0 to 200ms after the sound generation in order to avoid standing wave effects. Thereafter the correlation image sequence followed. The duration of the measurement was up to 25s. Fig 2: ESPI principle with ultrasonic excitation ("out of plane"). For comparison of the two excitation methods a landing flap (850x240x4mm3) of CFRP was used. Three stringers are attached to the skin of the flap ("see figure 3") where the middle stringer (number 2) was broken and delaminated from the skin. The flap was investigated with thermal- and ultrasound excitation over an area of about 200x250mm2 (shaded area in figure 3). The images were taken after excitation. Figure 5 shows the result for thermal excitation. Fig 3: Landing flap. Fig 4: Comparison between thermal and ultrasound excitation. Near stringer 2 a defect is visible in form of an inhomogeneous deflection of the skin (high fringe orders indicate a large out of plane movement). The explanation for this behavior could be a delamination of the skin in this area because stringers well bonded to the skin normally act like fixed supports as can be seen at stringer 3 (see also figure 4). With this excitation method the location of the stringer fracture can not be determined. However, with ultrasonic excitation it is no problem to locate the fracture (figure 6). The local deflection in figure 6 shows the area of hysteresis caused by internal friction of the fraction. The image shows a high order of interferometric fringe patterns caused when the flap moved between the images due to unstable mount. Fig 5: Thermal excitation. Fig 6: Ultrasound excitation. In the following figures the cooling-down process of an impact damaged CFRP-specimen (100x150x5mm3) is shown over a period of 13,4s. The specimen was excited during 3s with an input power of 200 Watt. The impacts are well visible in the time sequence in figure 7. Sample motion as a result of ultrasound coupling could be avoided. The visible temporally shifted delaminations allow to investigate the nature of the defect and the depth where it is located. This plate was also investigated using three other non-destructive methods (figure 8). air- coupled-ultrasound (AUS) displays the difference of acoustic impedance in the transmission mode (R. Stoessel). A laminated foil is detected on the upper right quarter of the plate. This is also visible in the ESPI images. 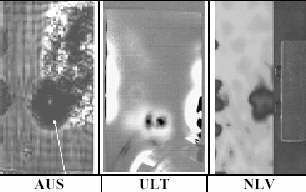 The image in the middle obtained with ultrasound- lockin-thermography (ULT, T. Zweschper) shows areas heated up by hysteresis. Non-linear-vibrometry (NLV) detects the "clapping" of the impacts (N. Krohn). All methods show the defects in the light of their specific physical properties. The images compliment one another. Fig 8: Compare with other methods. Another important material group of plastics is glass fibre reinforced polymers (GFRP). The inspected plate (235x110x5mm3) consists of two layers with 2,5mm thickness. A foil was embedded between the plates to simulate a bonding defect. An ultrasound pulse was injected during 200ms at an input power of 1700 Watt. The reference image and the following image sequence were taken after a delay of 30 ms. Investigations by thermography with injection of high power ultrasound pulses do not show external damages. The half plate is visible on figure 9 and figure 10. The foil is identifiable with air- coupled-ultrasound in the transmission mode as a result of the differences of acoustic impedance (see figure 9). Furthermore another defect is visible in the middle of the foil. 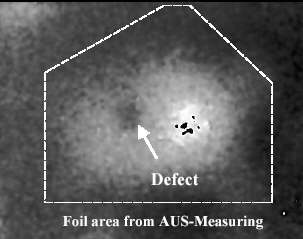 Figure 10 shows the Ultrasound-ESPI image where both the foil and the other defect are detected. The image was generated after ultrasound excitation in a time period of 1,2s. The delamination is well visible. The bump does not reveal fringes because the delamination is below 0,4ľm height and the first fringe is not developed. The lateral defect area is smaller than in the figure 9 (dashed line in figure 10 shows the defect area of figure 9). The "out of plane" movement in the middle zone is higher than in the border area. The movement of boundary surfaces is more restricted on the borders due to the higher stiffness. Therefore the generated heat and the thermal expansion are lower in these areas. Fig 9: Air-coupled-ultrasound (transmission). Fig 10: Ultrasound-ESPI (1,2s after excitation. A cup and a plate were used to investigate cracks in ceramics whose expansion coefficient is only 2-12*10-6K-1(8). The small thermal expansion makes the detection of defects deep underneath the surface difficult. However, thermal expansion due to defects in the surface is well possible using ESPI. An input power of 250 Watt was injected into the cup and the plate during 1s. The ultrasound was coupled in the bottom side of the cup. 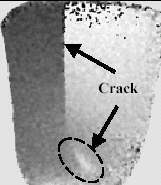 In figure 11 the crack is seen inside the cup and in figure 12 on the outside. In contrast to thermography ESPI shows the mechanical effects due to heating. The half right side of the cup expands much more than its left side (brighter area). The defect is clearly visible. As the cup is reinforced at the bottom it can expand only locally (marked zone). 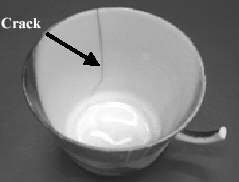 Fig 11: Cup with crack on the inside. 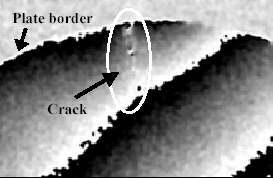 Fig 12: ESPI image with crack on outside. The plate in figure 13 was investigated using the same parameters. In this case the crack on the plate border was also detected (figure 14). The other fringes were caused when the plate moved during ultrasound injection. 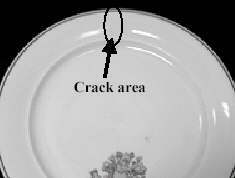 Fig 13: Plate with crack. Fig 14: US-ESPI. ESPI with ultrasound excitation allows to improve interferometric defect detection in materials and structures. Local thermal expansions of defects could be verified (e.g. delaminations, cracks, bonding defects etc.). The high injected ultrasound power limits the size of objects to approximately 0,5m2. For investigation of larger surfaces it is possible to use piezo-transducers which are laminated already into structures ("adaptive structures" or "smart structures"). These act as oscillation generators and can be used for a self test of the structure (7). This method of acoustically activated defects (which is obviously also applicable to other interferometric methods, e.g. shearography) allows for more reliability in non-destructive testing of structures and materials. The authors are grateful to Dipl.-Ing. R. Stössel, Dipl.-Ing. T. Zweschper, and Dipl.-Phys. N. Krohn for comparative investigation with other methods and to Prof. Dr. Igor Yu. Solodov for very helpful discussions.